Showing 3 articles from October 11, 2013. 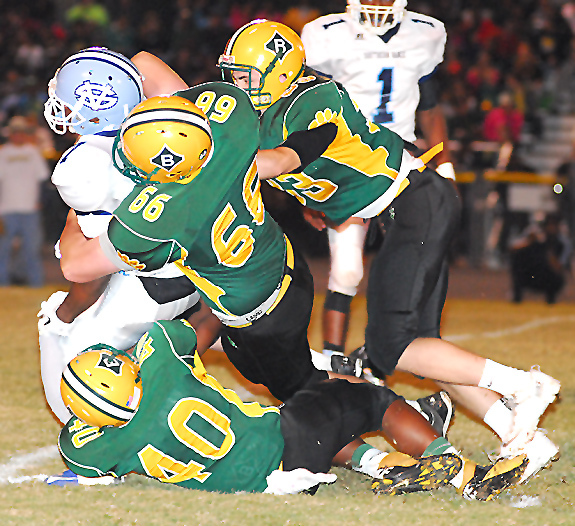 BUNN -- The newest configuration of the Northern Carolina Conference began with one of the league’s best former rivalries -- Southern Vance against Bunn. BHS and Southern played some memorable games in the early to middle portion of the 2000s before the Raiders moved up to the Class 3-A level. CREEDMOOR -- One of the most anticipated matchups of the Northern Carolina Conference football schedule will certainly be remembered as one of its wildest. In the NCC opener for both clubs, Franklinton and host South Granville combined for an unbelievable 124 points on Friday -- with SG holding on for a 67-57 conquest. TILLERY -- Due to poor recent weather, Louisburg High School’s scheduled opener of the Tar-Roanoke Athletic Conference football season has been postponed. Instead of being held Friday, Louisburg’s game at Southeast Halifax has been pushed back to this coming Monday at 7 p.m. on the SEHS campus.